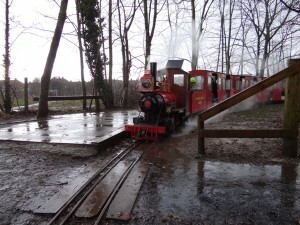 As the name and address of the railway might indicate, lakes and ponds are part of the normal surroundings. However, this year, owing to the severe wet and windy weather more lakes, hopefully temporary, have appeared and the rails have, at times, become semi-submerged under ever rising surface water. 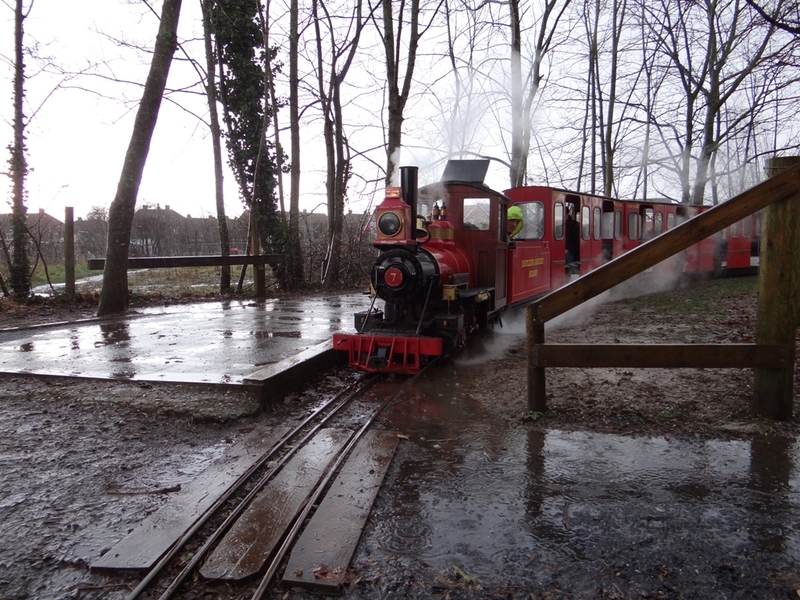 The railway continued to operate despite the appalling conditions with trains running every weekend and during the schools’ February half term holiday. 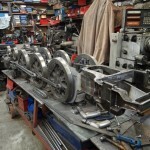 The valve gear and pistons of 10¼″ gauge 4-6-2 Pacific No: 6220 ‘Coronation’ were successfully overhauled and the locomotive has returned to the operational fleet. Also passing through the workshops for minor repairs was D1994 ‘Eastleigh’, the railway’s 10¼″ gauge diesel hydraulic, following the discovery of cracks on the radiator mountings. 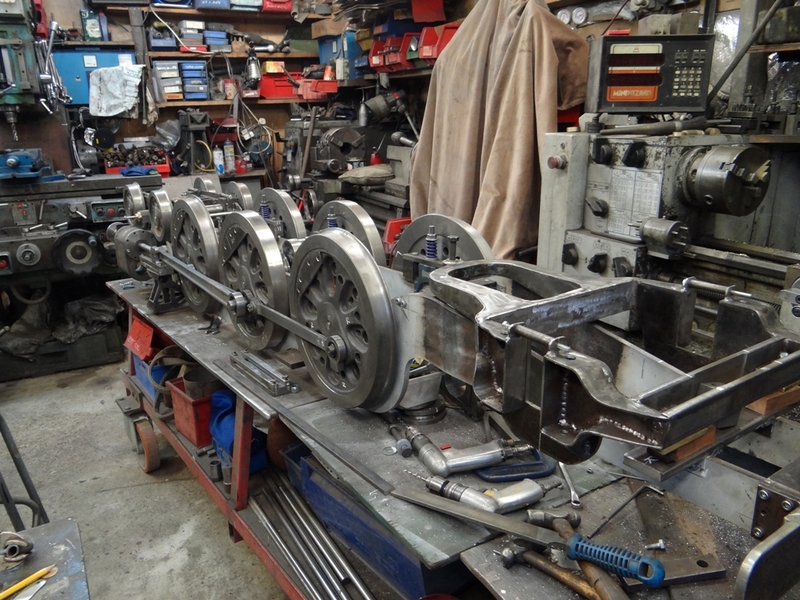 Work continues apace on the refurbishment of several First and Standard carriages with some having completely new body work whilst others simply had panels or floors replaced. In readiness for the ever popular ‘Day Out With Thomas’ events, Bullock locomotive No: 1001 ‘The Monarch’ which masquerades as No: 4 ‘Gordon’ entered the workshop for a planned overhaul mostly to the pistons and connecting rods. This work was finished by mid March giving plenty of time for any glitches to be ironed out before the first ‘Thomas’ event in May. Work is progressing steadily on the railway’s new build locomotive 4-6-2 Pacific, re-built Merchant Navy No: 35004 ‘Cunard White Star’. 1. N0 35004 ‘Cunard White Star’ under construction. 2. N0 35004 ‘Cunard White Star’ under construction. 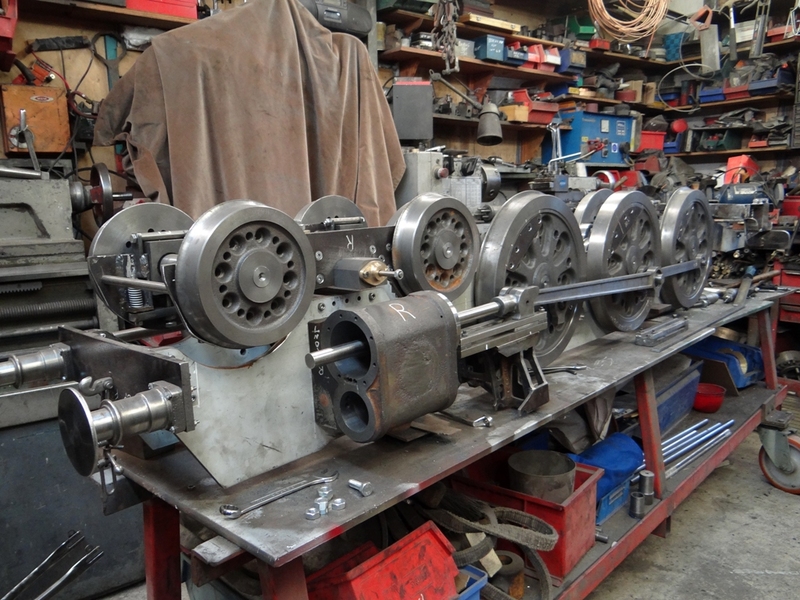 Once again, the workshop and engineering skills of Jesse Moody are being used to build this engine and to date the frames of both the locomotive and tender have been completed, whilst the wheels, piston blocks and some of the motion have been added to the engine’s frame. 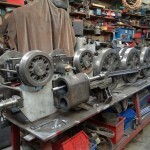 To help with the fabrication of some parts of the locomotive, photographs were taken of the full sized version of a re-built Merchant navy, namely No: 35028 ‘Clan Line’ when it was at Stewarts Lane, being prepared for mainline duty and thanks must go to the support crews for their considerable help. No specific timescale has been put on the construction of No: 35004 but it is hoped to have it ‘launched’ on the railway within the next twelve months where it will become a valuable stable mate to un-rebuilt Merchant Navy No: 21C1 ‘Channel Packet’. 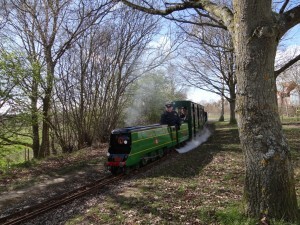 Un-rebuilt Bullied Merchant Navy 21C1 ‘Channel Packet’ Spring Steam Gala. Returning to the theme of ‘Day Out With Thomas’, Clive Upton, Dave Hart and Rob Hart were surprised and delighted to receive, from HIT Entertainment at the Forum Awards ceremony held at Drayton Manor Hotel in Tamworth the certificate for, ‘The Best Overall Event 2013’. This is quite an honour especially as Lakeside was competing against some of the major standard gauge railways in the country. The certificate is proudly displayed for all to see at Parkway Station. 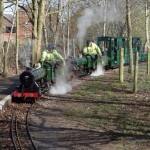 All staff and volunteers at the railway are looking forward to another successful series of events in the coming months. 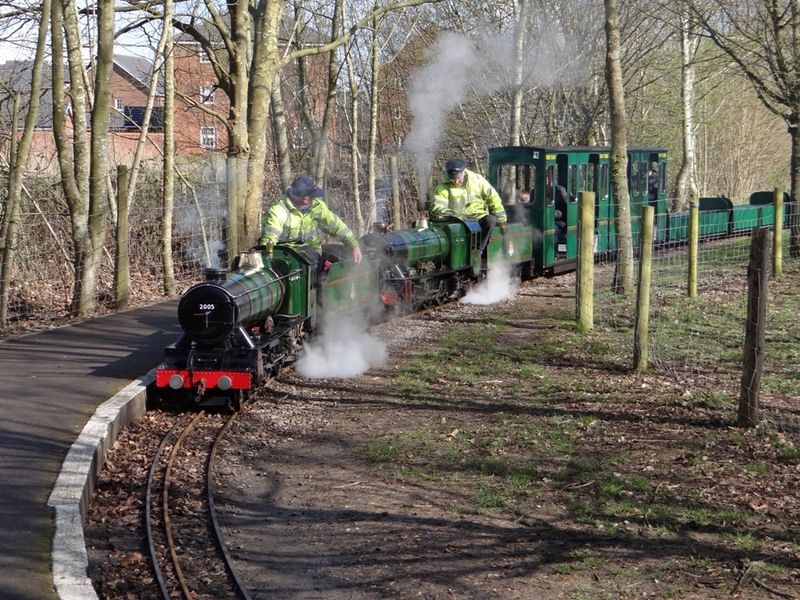 The Railway’s Spring Steam Gala was held on Sunday 23rd March when eighteen of the resident locomotives were in steam varying in style from narrow gauge prototypes through to B.R. Britannia Class. There was a selection of 7¼″ and 10¼″ gauge engines hauling freight and passenger trains, some of which were double-headed. 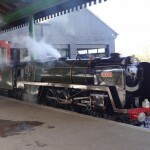 Most notable was the 10¼″ gauge version of super power – two Bullock 4-6-2 locomotives, No: 2005 ‘Silver Jubilee’ and No: 2006 ‘Edward VIII’, working together hauling full passenger trains. 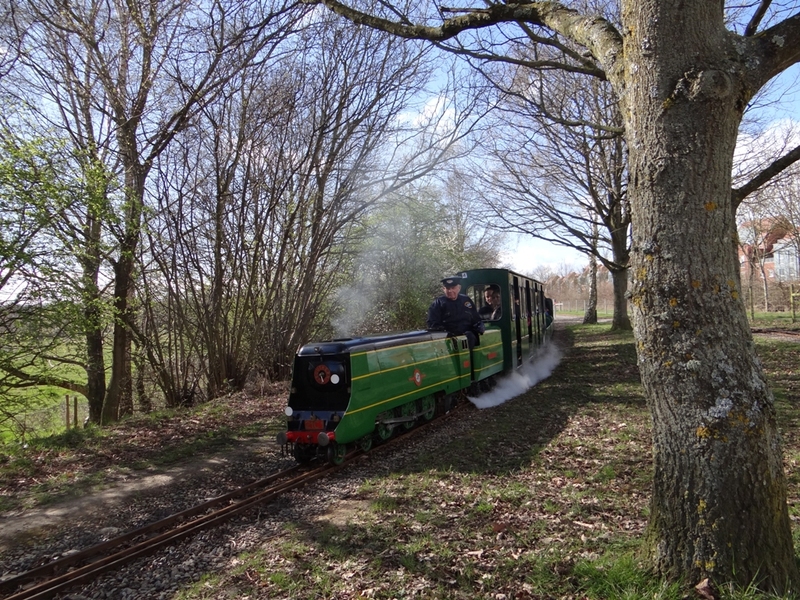 The sight of so many locomotives in steam must have gladdened the hearts of the many visitors whether they were railway enthusiasts or people just content to enjoy the thrill of riding behind a steam locomotive albeit in miniature. 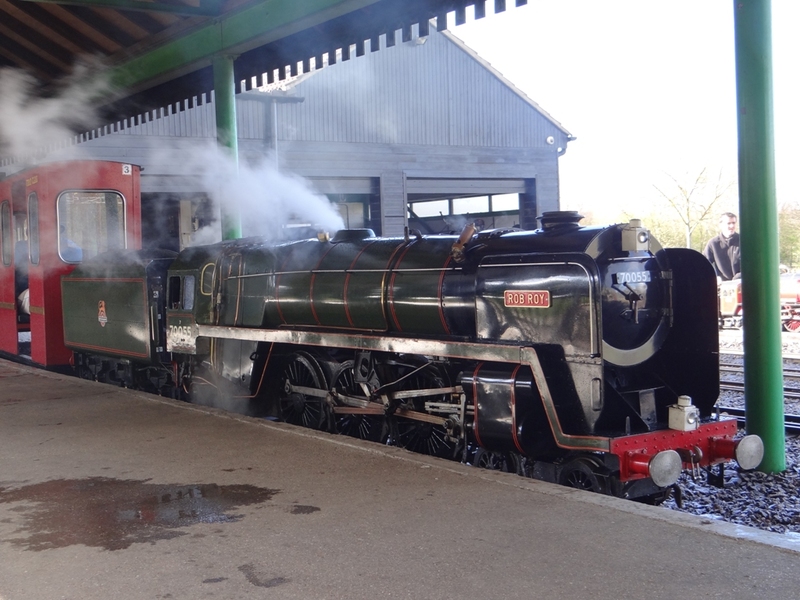 Britannia Class No 70055 ‘Rob Roy’ resting at Eastleigh Parkway Station, Spring Steam Gala. With the coming of warmer, drier spring weather a start has been made on track maintenance with particular attention being paid to areas of the track that suffered from high surface water levels during the deluge of recent times.